Small Team Edition is the perfect product to help you embed methodology into your project team or small department. The Edition contains an extensive set of popular pre-scaled generic methods as well as DSDM Atern and PPP methods. You can also add the official PRINCE2© and MSP© methods if you want. The Edition supports use of both the Browser App for team members and view only users as well as the fully featured Windows App which can be used in installed or portable modes giving core team members great flexibility to access project tools and integrate with MS office and their other desktop applications. The Desktop App is Windows 10 32 and 64 bit compatible and also works on older Windows versions. Small Team Edition is quick to get working with, as the users can continue to work with word, excel, visio, autocad and any other files needed, with the comfort that these are configuration managed by Small Team Edition. Small Team Edition includes a mix of licences for up to 20 users and a user permissions model then allows you to control what each user can do and which projects they can access. You can even use Small Team Edition to share access to your projects with partners, suppliers and customers all used under your tight control. The Small Team Edition is excellent value at just £50 per user. If you want an in-house project management solution for your small team there is nothing else in the market that offers this level of capability at this price. Production and sharing of reports on the stage, project, iteration or other part of your project methodology is often quite manual in nature and prone to calculation errors. Small Team Edition can produce a standard range of reports for you at the press of a button using data already collected in your project including planning and resourcing elements. You can edit these reports including branding before you print them. Alternatively, let the system publish them and notify recipients for you. A good degree of customisation is available and you can also use the system to collect, process and report on your own data sets from excel if you need to. The technology is all Microsoft standards making it acceptable to your IT department. So the server can be operated from a PC or laptop, VM or your existing network server if you wish. Furthermore, our Silver Services Package makes sure you get up and running quickly. The package includes basic user training and a guide to customising your methods. Small Team Edition lets you personalise the methods or even create your own methods to manage and document your activities. This gives you unparalleled flexibility to set the processes you need and then monitor adherence to them. Now with a new Browser interface so you can have cost effective project management on any device. Small Team Edition also boasts additional portfolio management capabilities and inter project dependencies. 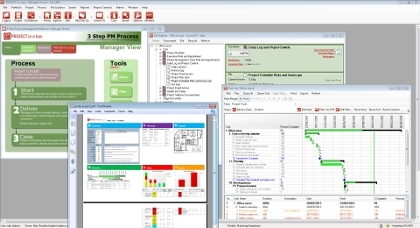 All this for just £999 for twenty users, no other cost effective project management software gives you so much.